Is our reverence for la famiglia genetic? Have you heard of the term “blood memory”? Until recently, I hadn’t. Although I have felt that which the term points to many times and, unknowingly, it was exactly this mysterious, magical idea I had been, again and again, trying to define on the show with guest after guest. Blood memory. That’s it, I said. The phrase instantly made sense to me. Something in your very blood knows. Your very blood knows this is familiar; this is safe; this is something I understand. This isn’t necessarily a new idea; world-renowned psychologist Carl Jung toted the idea of the “collective unconscious” decades ago, which is the theory that we human beings are born with shared memories, or archetypes. The widely held fear of snakes, for instance, and their symbolism as evil, would be an example of an archetype. Across nations, across centuries, across cultures, the snake largely serves as a symbol of the devil, spreading sin and immorality. It’s an understanding we seem to be born with, as if it has been passed down through a genetic memory. The procession at the Feast of St. Filomena. Every summer growing up, my family drove about 20 minutes upstate to Black Rock Fish and Game Club, where a feast for Saint Filomena was held. Tens of Italians, the vast majority of whom we knew, gathered there with their own families. The women brought Tupperware packed with homemade food; the men brought beers, bocce balls, and homemade wine. We played soccer, went fishing, danced, and ate all the pasta, pané, and eggplant rollatini we could possibly stomach. But all of that came after. First, there was the procession. My cousin, Antonella, right, and I posing proudly at the feast. 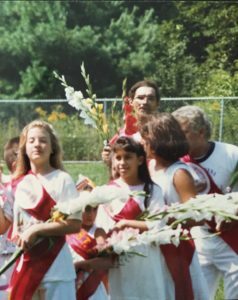 Dressed in white from head to toe, we made a long march beneath the sun, gladiolas in our arms, red satin sashes with the saint’s name embroidered upon them hugging our chests. We shuffled a solemn, silent march around the grounds in the New-York August heat until we came back around to where an altar of the saint was erected. Grown men would drop to their knees and crawl to the idol of St. Filomena. With American money taped to the glass housing the statue, the men would bow and make the sign of the cross below it, paying gratitude to the saint they had prayed to, maybe to save their mother’s life, their child’s, or their own. There was real solemnity in that procession, real reverence and respect. To see such a thing – let alone be a part of it – is to never forget it. When I think about those days, I know they can sound ridiculous to a non-Italian American; I know they can sound provincial, idiotic, even laughable. But I never felt anything but at home in that procession. I felt like I belonged. I owned this ritual, this rite, this tradition. It somehow made sense to me, even though no one (as hard-working Italian immigrant families are wont to do) took time to explain it to me. I didn’t need it explained. It had an understanding I seemed to be born with, as if it had been passed down through a genetic memory. 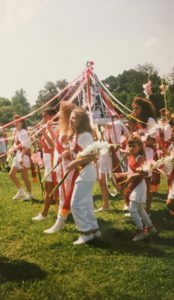 I was a modern American girl raised in New York, why would such an ancient, authentically Italian tradition resonate so deeply within me? Of course, the fact that it had been something I was raised with contributed to its normalcy, but I’m not talking about normalcy. I’m talking about feeling, connecting, communing. It’s deeper than knowing, which happens in your brain. It’s below that. It’s in your blood. It’s blood memory. Which may explain my relationship to Roman Catholic items. For as long as I can remember, and certainly without being taught any sort of connection, the old, heavy-mahogany-framed religious prints – the kind your nonna nailed up throughout the house – the crosses hanging on bare walls, the rosary beads slung over bed frames, all of it, evoked within me a feeling of…home. I believe this is an example of blood memory. 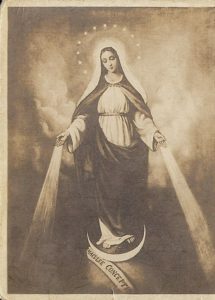 I am Southern Italian on both my paternal and maternal lines, a part of the country where Catholic iconography, and the use of it to protect oneself, one’s family, and one’s property, runs deep. I think such imagery feels like home because it is. Because for my ancestors, it was a means of staying safe in this life; whether it’s by true faith or by the art of superstition, having images of Jesus, the Virgin Mary, the cross, and the various saints around was a way to ward off evil and trouble. Or at least an attempt to. According to the theory of genetic memory, this ‘survival tip’ would then have been passed down in the very sperm and egg of the man and woman who created me. 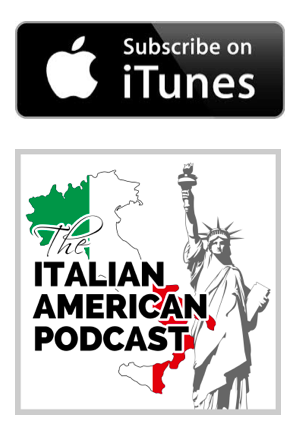 So what does this have to do with being Italian American? I’m beginning to think a whole lot. For us Southern Italians especially, which more than 80 percent of Italian Americans are, government was never a friend to our ancestors. Could it be that our devotion to la famiglia, our worship of it as the principle thing to place above all else stems from more than just teachings and traditions? Is it genetic? Is it blood memory? I didn’t know it, but Talese and I were talking about blood memory. This distrust of government directly correlates with the enormous placement of trust in the family. The more our ancestors could not rely on government to save them, protect them, lift them up, the more they turned to the insular unit of the family to provide those very things. If mice can be trained to avoid a smell out of fear and thus turn away from it, certainly it’s plausible that we have learned – in our very blood – to place our trust and allegiance in the family as a means of avoiding placing it instead in the hands of institutions our ancestors learned would only harm and take from us. So the next time someone tells you they wish they were part of a big Italian family like yours, the next time you gather with your family around the table, remember that allegiance, that bond, that need to above all put your family first likely goes deeper than your upbringing. It’s in your DNA. It’s in the very materials that forged you. It’s in your blood, amici.